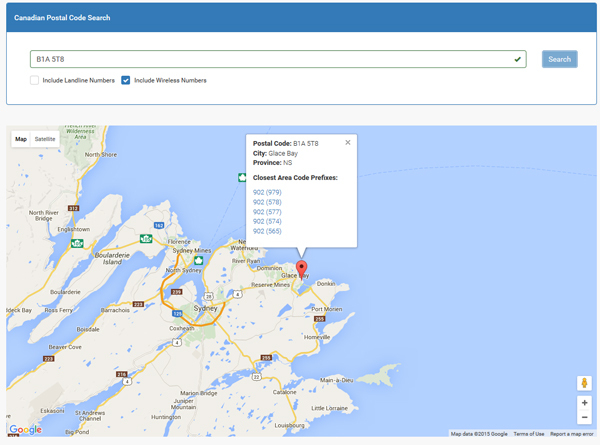 The CPL Canadian Postal Code Tool is the easiest way to geographically target Canadian Telecom data. Simply enter a Canadian Postal Code, select landline numbers, wireless numbers, or both, and search! The 5 closest NPA (area codes) and NXX (prefixes) will be displayed. The CPL Canadian Postal Code Tool is the most accurate and complete tool of its kind anywhere in the world. Our data is updated daily, and our Postal Code Tool is the most convenient way to find the closest phone numbers to any postal code in Canada! If you purchase a Cell Phone Number List for a Canadian Area Code then the search tool for that Area Code is included at no cost. We also offer standalone access to the Postal Code Tool. The cost is only $149.00 for access to every Area Code within the search tool. Note: Standalone access to the search tool does not include access to the associated Cell Phone Number Lists.